Benoa is a port city located near Bali’s southernmost tip and is the gateway to the Nusa Dua beach resort. Indonesia has 13,500 islands of which over 6,000 have occupants on them. Indonesians are predominately Muslim, however, Balinese belief is based in Hinduism and Bali is known for its interesting temples. The temples are generally dedicated to the Hindu Trimurti:Brahma or creator of the universe, Vishnu the Preserver and Shiva the destroyer. 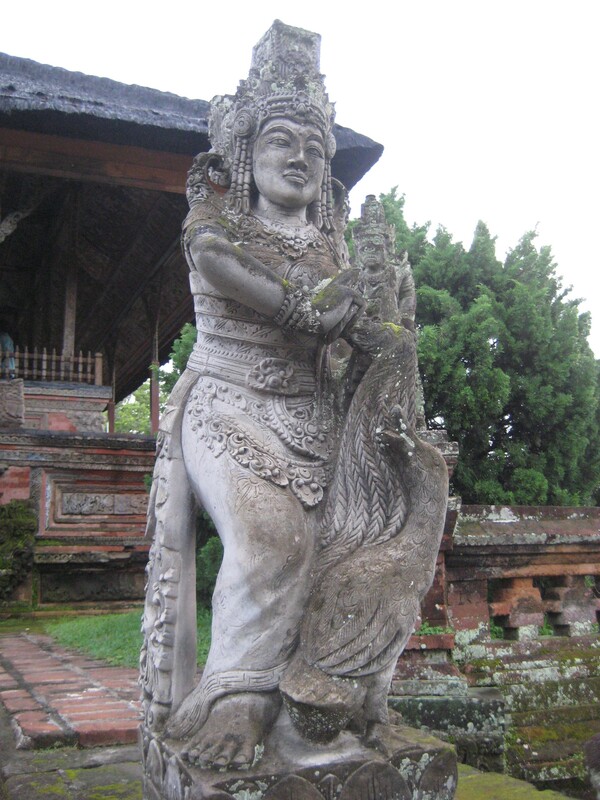 Balinese Hinduism differs from the Indian version, however the Balinese people recognize not only the Hindu Gods, but a special set of deities all their own. The temperature was over 90 degrees and extremely humid not to mention that it rained from time to time throughout the day. Sometimes the rain would only be a light shower while other times it would pour buckets and there would be an electrical storm as well. Our tour today took us first to the Besakih Temple complex (it is comprised of 23 separate, but related temples) located about a two-hour drive from the port. 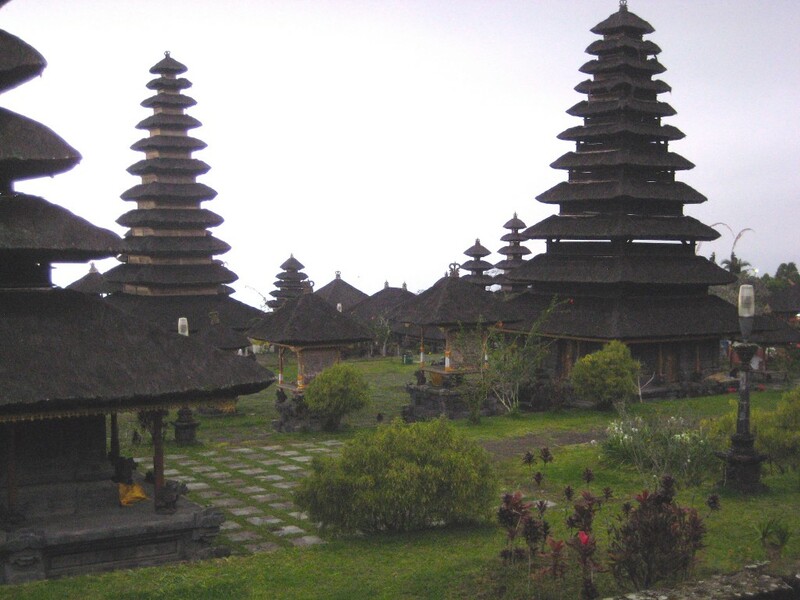 This is the most revered temple among Bali’s many shrines and differs from others because it belongs to everyone rather than just one village. 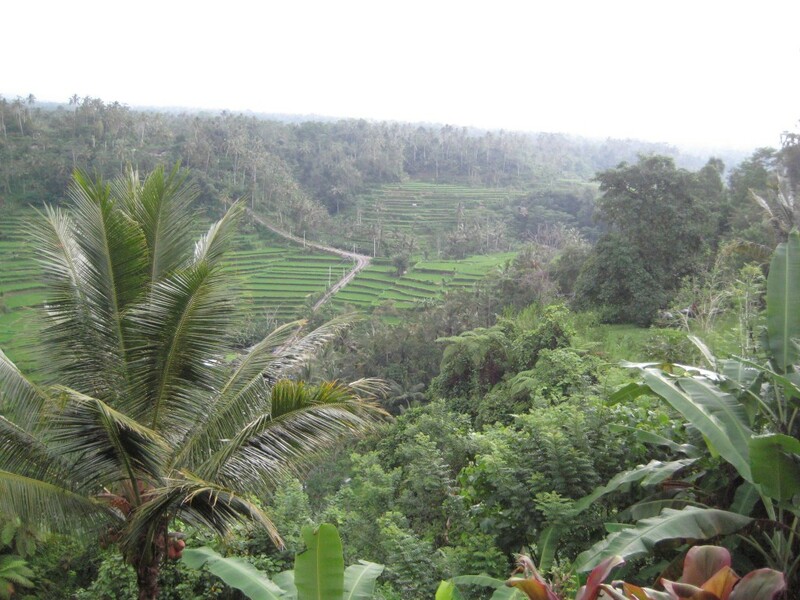 It is located on mount Gunung Agung rising about 3,000 feet above sea level. The temple is believed to have begun more than 1,000 years ago with additions and modifications continuing to this day. 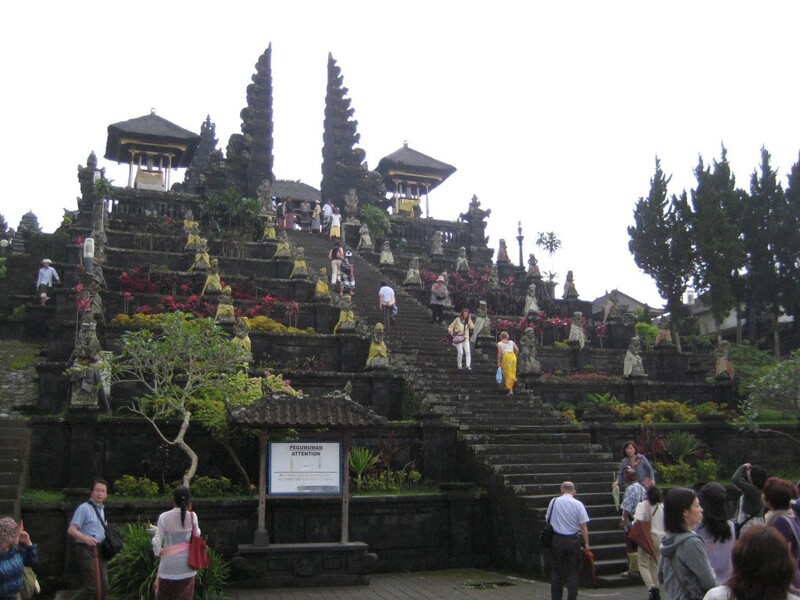 The Pura Penataran Agung temple is the largest and most impressive with six-tiers terraced up the side of the mountain. A grand staircase leads up the front of the temple to a large gated courtyard with multiple structures, each ornately decorated. The stone is local volcanic rock, mostly black in color and ornately carved. Locals were being bussed to the site to make offerings of fruits, trays of flower petals and incense. Most of the men wore white headscarves and white shirts to the temple while the women wore colorful sarongs. Both the men and the women had their shoulders and legs covered. From the temple we winded our way a short distance to a restaurant called Mahagiri, which offered a dramatic panoramic view over a valley of terraced rice fields. The open-air restaurant served a wonderful buffet lunch of local dishes including chicken, tofu, rice, noodles, chicken satay, salad and vegetables. For dessert they served banana fritters with a dark brown sugar sauce and fresh fruit. Our next stop was to Puri Agung Karangasem, built in the 19th century by the first king of the Karangasem Kingdom located in the town of Amlapura along the far eastern shore of Bali. This once royal palace combined three different architectural styles. 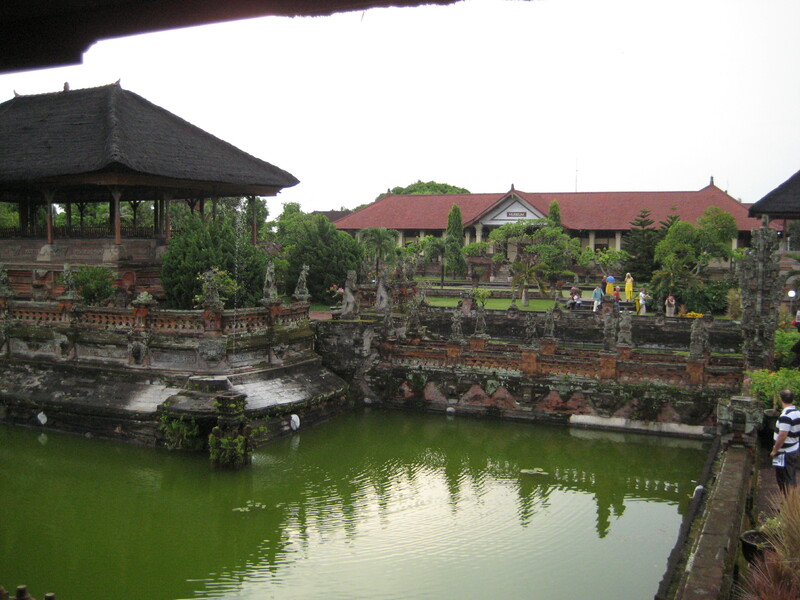 Balinese influences can be seen in the carvings of the Hindu statues and the reliefs on the walls of the building while European influence is seen in the architecture of the main residence with its large veranda. Chinese architecture is seen in the style of the windows, doors and other ornamentation. There is no longer a royal family and so this residence is more of a museum with some of the rooms in the residence under restoration. The grounds include a beautiful lily pond surrounded by several outdoor pavilions with unique pottery urns planted with local shrubs and flowering plants. Unfortunately age and the weather are taking a toll on the residence and it has lost some of its glory. Our last stop of the day was to Klungkung Kertagosa, a complex built in 1710 by some of the finest artisans in the country at the time. The complex contains the Bale Kambang floating pavilion and the Kertagosa or Royal Court of Justice. Each of these structures is a raised open-air pavilion with richly painted murals on the interior peaked ceilings. The originals are now housed in a museum but have been replaced with replicas. The Court of Justice contains a large table and chairs where criminals would be seated across from a judge to plead their case before being punished for whatever crime they were charged with. The murals above are explicit, colored murals depicting several rows of acts for which you would be punished and suffer the fate of hell while the upper tiers of the mural reflect good behaviors for which you would be rewarded eternal life in paradise. The site is very well preserved and contains beautifully landscaped gardens. In general the island is very lush and green with all sorts of vegetation from ferns to banana trees, rice fields to plumeria. The denseness of the vegetation reminds me of the lush vegetation you find in Costa Rica. Most houses as you drive by have a small temple of sorts out in front of the house and are usually freestanding. Some are quite small in size; maybe one-foot square while others are much larger with a grass style roof peaked like a mountain. Each of these temples has some type of fruits or flowers or a combination of the two as an offering. Then within the fence or wall surrounding the house you can see many more of these temples one right next to the other, all with fruits and flowers. Most homes have five or more of these small temples standing five or six feet tall. It makes me think that this is a very religious region of the world. Back onboard the ship after more than nine hours of touring, we were treated to the last of the mariner appreciation events. Once during each world cruise a special event, a year in the planning and at a reported cost of $500,000 takes place. This year Bali was chosen as the theme for this special mariner event. The entire main pool area and Lido Restaurant had been transformed over the last 24 hours into a premier party event. It was titled Pasar Malam Indonesia, or night market. The pool had been transformed into a pond surrounded by live rice fields. The entire pool area was screened into many private dining areas and bars with the use of bamboo screens. Bandstands were created with bamboo of various sizes and a bamboo hut was now standing where the pool once was. Potted palm trees, sago palms and orchids were placed throughout to create the look of a rainforest. Local crafts were for sale including batik clothing, woodcarvings, stick puppets, leather goods, paintings, jewelry and more. 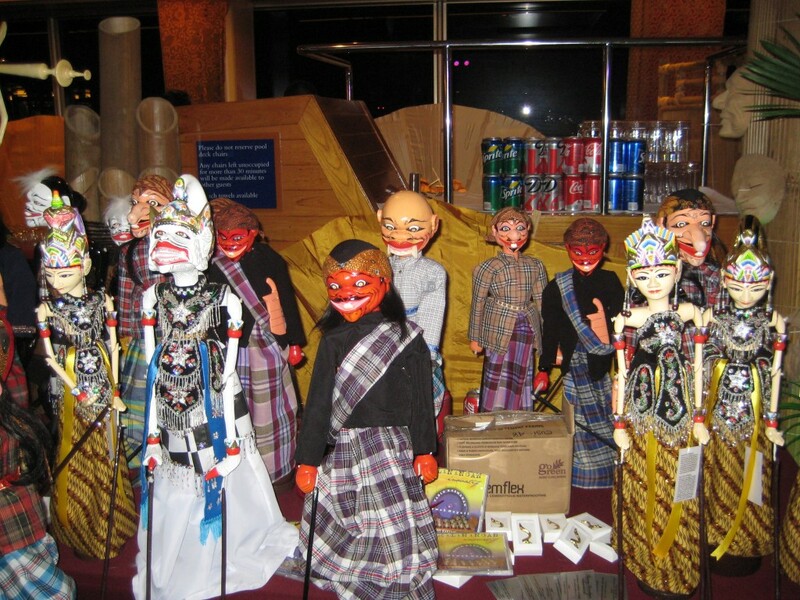 A local Gamelan band, a Wajang shadow puppet show, a Sinden Singer and Suling flute player, Jaipong dancers and a Angklung orchestra performed. A Becak-Becak or three-wheeled cycle taxi was giving rides around the deck in exchange for a donation to a local charity. Everywhere you looked there was something going on that was colorful, festive and entertaining. Not only was there entertainment and things to buy but, there were tons of food and an open bar for over four hours. The Lido was filled with local foods including roasted pigs, fish wrapped in leaves, noodle dishes, rice, fresh cut coconuts for drinking the coconut water with a straw and a huge assortment of unusual local desserts. The Canaletto restaurant was transformed into an Indonesian restaurant for the night and was part of the fundraising efforts for the Rainbow Foundation. The Rainbow Foundation is a medical shelter for children from all over Indonesia and is located in Bekasi near Jakarta. The foundations helps parents with limited funds pay for their sick children’s medical treatments and provides housing for them during their recuperation. They also house about forty children who do not have parents or relatives to take care of them. Guest who ate in the specialty restaurant this evening made a donation of $25 to the charity, while others contributed as well. Many of the dining room stewards, cabin stewards and crew members come from Indonesia so many of them were able to have their families come onboard the ship for a short visit today. Most of the guests put notes on their cabin doors asking that they not have their cabins cleaned on this day and for the stewards to spend time with their families and friends instead. Although we weren’t too hungry after our big lunch, we decided to sample a few of the many Indonesian dishes on board for the party. There were Indonesian dishes we didn’t know, fruits, desserts, roasted pigs, etc. 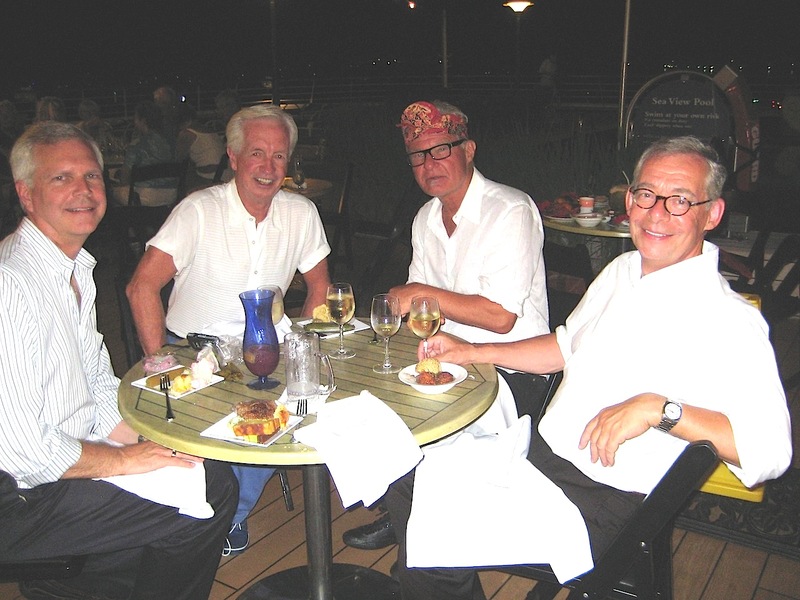 After filling our plates with “samples” of almost everything, we joined Peter, Peter and Bryan on the Lido deck by the back pool to eat it all. Free drinks and wine were being served. We shared lots of info and gossip with these Toronto boys. Good times!